The last of three open CPD sessions in Walsall took place yesterday at North Walsall Academy (previously Charles Coddy Walker). For the benefit of attendees at these events, and schools who have gone through the Skills & Mastery or 21st century British Muslim courses, this short post demonstrates the integration of Talk4Writing with Cooperative Learning. For more on the events, see Better Reading through Cooperative Learning and “Outstandingly Simple”follow-up; an introduction to Cooperative learning at Queen Mary’s Grammar School. In yesterday’s session, we looked at various ways to stage the exercise Simultaneous Write-Round, where pupils working in small teams produce writing on a sheet or blank A4, and, when prompted, pass it to the next person to continue the story or solve other tasks. This makes use of time pressure to get pens to paper, and gives a sense of responsibility for the finished product. In Early Years or for EAL, writing one word per pupil would suffice. “I … see … an …car.” Simply spelling the words and identifying how they fit grammatically (e.g. car is the wrong subject after the definite article an ) or to give a meaningful sentence is challenging enough. In KS2, some students will write a lot, some will write only a couple of words. Peer input aside, writing can be guided by tasks presented on the worksheets themselves, by peers or teacher, on a interactive whiteboard or just orally by the teacher. We used the sheet “First what happened was… and then…” etc. To support structuring a short story. We also looked at using Simultaneous Write-Round for assessment and meta-cognition, using some very dense questions to simulate the challenges faced by lower ability pupils under pressure. A bit too much on a late, drowsy afternoon – my apologies! Obviously, what everyone was most interested in, and had a good laugh about, were the collaborative stories you wrote. What follows should be self-explanatory, but for readers looking for more information on this system, please visit their homepage for more details. To exemplify, I am going to walk through a description of the first stage, Imitation. (All stages in the system found here). As we all know, Cooperative Learning is a delivery tool for any materials and objective, so to provide content I have picked Adventure at Cambary Park found in the PDF Story Reading into Writing from the T4W resource page. You can read the story about two girls finding a stolen treasure and being chased by a dangerous criminal below. Original text is italicised, my comments are regular text. Once the teacher has established a creative context and an engaging start, a typical Talk-for-Writing unit would begin with some engaging activities warming up the tune of the text, as well as the topic focused on, to help children internalise the pattern of the language required. Here Catch1Partner or Word-Round with relevant oral questions from the teacher are obvious and simple ways to integrate Talk4Writing with the simultaneous interaction and high individual accountability secured by Cooperative Learning. As they are presenting their solutions to peers, use unobtrusive monitoring to assess children’s levels, areas of interest, uncover potential pitfalls, etc. and drive their thinking to reflect your observations by simply dropping relevant, guiding questions into one of these activities. “What would you do if you found £20 on the street?” – “Can we always keep things that we find?” – “Imagine being chased by a criminal! What would you do?” Just ask whatever you think appropriate to that specific class. No preparation necessary. This is often followed by talking an exemplar text, supported visually by a text map and physical movements to help the children recall the story or non-fiction piece. In this way the children hear the text, say it for themselves and enjoy it before seeing it written down. This seems to be individual listening and physical activities. So, just do this as you normally would. Only use Cooperative Learning when it supports your objectives! Obviously, Rotating Role Reading springs to mind. Especially the summarising and connection between paragraphs would help pupils uncover the “pattern” of the text, which I think is a keys to T4W’s success. …and start to think about the key ingredients that help to make it work. Here, add in a role with relevant questions or tasks, as we did with the science text last Monday, to “think about key ingredients.” I am sure your Talk4Writing resources have lots of useful ideas on this. Simply deploy what you would use anyway. Always remember, don’t do extra work! This stage could include a range of reading as-a-reader and as-a-writer activities. Understanding the structure of the text is easy if you use the boxing-up technique (see below) and then help the children to analyse the features that have helped to make the text work. Here the boxed texts are passed around in the Simultaneous Write-Round, as you saw it done yesterday. But rather than carrying the story in any direction from the previous pupil’s input, every pupil now has a clear model to work from thanks to Talk4Writing materials. In this way the class starts to co-construct a toolkit for this type of text so that they can talk about the ingredients themselves – a key stage in internalising the toolkit in their heads. 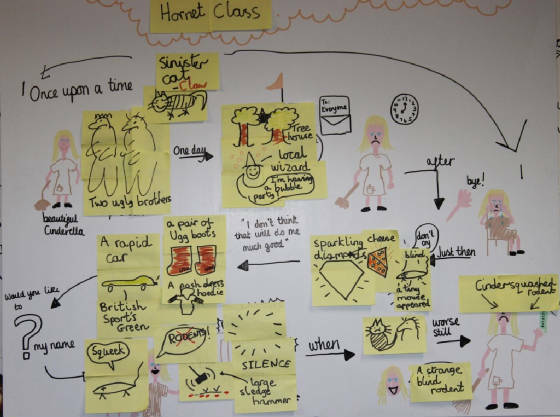 So, when all boxes are filled, team-members might take turns reading aloud the collaborative story on the paper they wound up with, and perhaps voting for the best one in relation to the T4W model – e.g. “Which of our stories is closest to the original pattern?” (Phrased age-appropriately, of course!). I hope this helped answer your question. Simple, instant, integration of Cooperative Learning with strategies, lesson plan and materials from Talk4Writing. I am hoping to find time to do a piece on collaborative writing for EAL and lower-ability pupils. Get notifications of related posts on twitter.